Every once in a while those of us who live in Grand Marais must take trips out of town to purchase items not locally available. 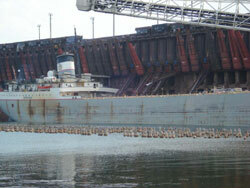 While in Marquette, I snapped a couple of pictures of a freighter. 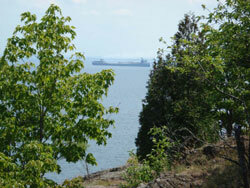 The first is the freighter heading into the ore dock. The second shows the freighter loading iron ore pellets. Notice the chutes that swing down to dump the pellets into the ship’s hold. 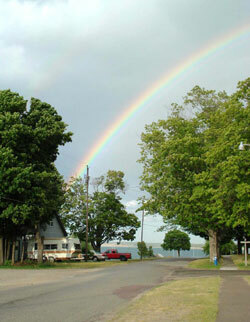 While working the museum one day, a brilliant rainbow formed over Grand Marais bay.